New York’s proposal to subsidize upstate nuclear power plants was blasted as a corporate giveaway and embraced as an economic lifeline and necessity to reduce carbon emissions in comments filed last week with regulators (15-E-0302). Although it was the first time commenters had the opportunity to respond to the projected price tag of the subsidy, the arguments were familiar. On July 8, the PSC staff released what it called a “responsive proposal” that calculated ZECs based on estimates of the social cost of carbon. The PSC said that would be $17.48/MWh for qualifying nuclear power generators in the first two years of the 12-year program, or about $965 million. A coalition of environmental groups — including the Alliance for a Green Economy, the Council on Intelligent Energy & Conservation Policy, the Nuclear Information and Resource Service and the Sierra Club’s Atlantic Chapter — continued its opposition. “After claiming the nuclear tier would cost only $270 million over 12 years, the new ‘responsive proposal’ outlined a plan that will cost nearly $1 billion in just the first two years, with costs escalating to total approximately $7.6 billion. The program will likely cost more than $10 billion if Indian Point gets included,” they wrote. Towns and legislative members from western New York also focused on the plants’ economic impact. Comments from the Town of Scriba, which is the site of three nuclear plants, Nine Mile Point 1 and 2 and James A. FitzPatrick, were typical. 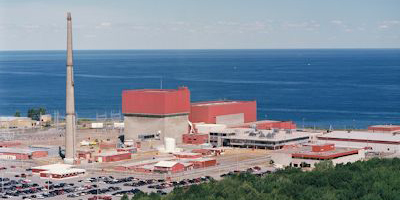 Exelon is the owner of three nuclear power plants on Lake Ontario, with two in Scriba, and is in negotiations to acquire a fourth. (See Entergy in Talks to Sell FitzPatrick to Exelon.) FitzPatrick has been scheduled to close early next year by its current owner, Entergy. Exelon said it would close Nine Mile Point 1 and R.E. Ginna early next year if a contract is not in place by the end of September. “Time is of the essence,” Entergy reiterated in its comments. A group representing large commercial and industrial customers complained that the July 8 proposal is an entirely new formula that is considerably more expensive than what was discussed in earlier proceedings. “In New York’s apparent haste to appease the owners of selected nuclear generation facilities to ensure the continued operation of those facilities, customers are being exposed to potentially 12 years of artificially inflated and excessive subsidy obligations,” it wrote. Likewise, the National Energy Marketers Association said the proposal interferes with the development of the retail market. “The proposed purchasing and pricing mechanism under which [load-serving entities] will be required to purchase ZECs will have an adverse impact” on energy service companies, it said. The Pace Energy and Climate Center supports the ZEC program by emphasizing it as a temporary bridge until renewable energy is built at scale, a point also emphasized by Exelon’s Constellation Energy Nuclear Group. “While the long-term goal for New York should be to replace the state’s existing nuclear fleet with renewables that are additional to the CES target, over the next 12 years, the governor’s plan to support the state’s nuclear fleet will ensure that New York is able to achieve its carbon emissions targets while making rapid progress towards the CES goal,” Pace wrote. The American Petroleum Institute proposed an expansive definition of credits for carbon reduction. “The NYPSC must create a level playing field by making emissions credits available to all technologies and energy sources that can reduce net GHG emissions from the electricity sector, including … energy efficiency measures, and other forms of electricity generation that can help achieve compliance with state emission reduction goals, such as natural gas, [combined heat and power], biomass, and waste heat power,” it said. The PSC could act on the CES at its next regular meeting on Aug. 1. The New York PSC unanimously approved its Clean Energy Standard, including a controversial plan to prop up struggling upstate nuclear power plants with a 12-year subsidy. The New York Public Service Commission turned aside numerous challenges to its adoption of a Clean Energy Standard and its subsidy for upstate nuclear power generators. Political and labor leaders have embraced the proposed zero-emission credit for nuclear power plants in upstate New York.